Meet the Designer: Kooler Design Studio, Inc. Spotlight on Cross Designers: Kooler Design Studios, Inc.
ABC Floral Sampler. Photo © Kooler Design Studio, Inc. There are so many cross stitch designers out there. Some have just started while others have been around for many years. They have stood the test of time and proven that they can not only hold to certain traditions but also be fresh in a new market. Kooler Designs is one of those companies. Let's find out more about this amazing designer and her patterns. Donna Kooler is the founder of Kooler Design Company and her daughter Basha is carrying on as president, designer, and creative director of Kooler Design Studio, Inc.
Donna Kooler graduated from art school in Los Angeles in the 1950's. In 1973 she became Design Director for Sunset Designs, a needlework kit company in Northern California. Donna started her own company, Kooler Design Studio, Inc. in 1985. Donna took great pride in her talented and creative staff, but she also attributed the success of the company to the wonderfully supportive companies she had the pleasure of partnering with over the years. Donna's daughter, Basha Kooler, continues to carry on the fine tradition of quality products and beautiful designs now that Donna is semi-retired. Cross Stitch Designers include Donna Kooler, Linda Gillum, Sandy Orton, Nancy Rossi, Barbara Baatz Hillman, and Basha Kooler. A wide variety of designs are offered in kits, books, leaflets, and as computer software. Kooler Design Studios, Inc. offers a wide collection of patterns compatible with Pattern Maker Cross Stitch Design software. In addition, stitchers can avoid postage and get instant gratification by purchasing high-quality chart downloads for a reasonable fee. According to Donna, "Because of our great relationships with our publishers and the ability of the designers, we are able to design for all levels of expertise." Kooler Design Studios has produced about 100 kits a year for the past 21 years from large intricate, challenging designs for expert stitchers to small minis or big stitch designs for beginners. On the Kooler Design Studio homepage find out the latest designs available, search for your favorite title, shop in the online store, and view images of designs that are currently for sale. If you are looking for an older chart, contact them. They are in the process of making many of their charts available for download. 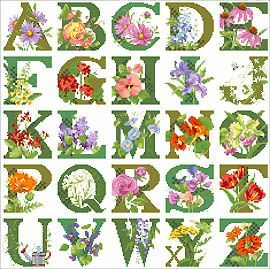 Classic floral sampler with a gardening theme. Great to stitch as an entire project, or use the letters individually or to spell words or sayings if you like. Barbara Baatz Hillman created A Stitcher's Sampler with images of collectibles, memorabilia and sewing sundries. It's available as a pdf download, designed for stitchers who wish to select their own fabric and floss. With such a talented team of designers capable of creating patterns related to almost anything, Kooler Design Studio produces a great diversity of designs. Each designer, however, adds a distinctive signature element to her designs. Barbara Baatz Hillman always adds a dew drop to her flowers. Sandy Orton specializes in Christmas stockings and samplers. Linda Gillum's baby ensembles are perpetual favorites. Nancy Rossi's artwork always contain the most glorious colors. Kooler Designs know how to stay fresh and up to date in the cross stitch world. They pride themselves on having something for everyone and at every level. Not many companies can say that and still have the staying power that Kooler Designs does. It is wonderful seeing how their designers have their own signature and represent Kooler in their own way. It allows the average cross stitcher to connect and realize that a person actually designed the pattern. Keep going Kooler! We love what you do.